Hamstring muscle strains are common injuries in sports that require maximum effort sprinting, acceleration and change of direction such as soccer, rugby, AFL and American Football [1, 2]. An average of 18 days is lost from competition and training after hamstring strain injuries with a high percentage of reinjury after returning to play (12-31%) . Muscle strains are thought to occur when muscles are actively lengthened to greater than normal or optimal lengths [1, 2]. Hamstrings (specifically the Biceps Femoris) are much more susceptible to muscle strains than other muscles due to its bi-articular nature. Meaning the muscle crosses over 2 joints, the knee and the hip, and therefore has 2 major actions (hip extension and knee flexion) . Movements such as kicking or the late swing phase of sprinting, the hip flexes and the knee extends simultaneously making the hamstrings activate at very long lengths, essentially putting them in a vulnerable position. At this point, only eccentric exercise has been shown to reduce hamstring injury rates (60-70% in various sports throughout a competitive season . It has been suggested that eccentric exercise shifts the angle of peak torque (optimum length) to longer muscle lengths, i.e. being able to produce more force at longer muscle lengths . All muscles have an optimum length for producing peak tension or force in this case. Many believe athletes who produce peak tension at shorter muscle lengths are more likely to be injured as if the muscle continue to lengthen past its optimum length, tension levels will decrease leaving the muscle vulnerable to strain . Shifting the optimum length to longer muscle lengths has been seen as a protective adaptation against future muscle strains. To prove the effectiveness of a variation of hamstring eccentric exercises, a case study by Brughelli et al. took a state level AFL player who had a medical history of 3 muscle strains (grade II and III) to his right hamstring (biceps femoris) over the previous 4 years. The most recent injury occurred 16 months prior to this case study and had missed several games and practises as well as attempting numerous rehab programs with no sustained progress in regards to pain, soreness or return to play. Eccentric exercise was performed over an 8 month period where the first 9 weeks (Phase 1,2,3) were during the off season, while the remaining 23 weeks (Phase 4) were during the pre and in season. Phase 1 was to prepare the athlete for more intense eccentrics. Each phase introduced higher intensity eccentrics (unilateral, increased load or drop height). Peak torque produced in the injured leg occurred at 37.3◦. After the 23 week intervention, peak torque was produced at 23.9◦ (a straight leg is 0◦). So what does this mean? The player’s optimum length of his injured hamstring improved by ~13◦ with peak torque production remaining similar to pre intervention values. He is now able to produce his peak force at longer muscle lengths. Before the intervention, the athlete could not complete a full speed or agility workout due to pain and soreness and was out for 3 days from training following those sessions. After just 9 weeks of the intervention, the athlete reported he could run at max velocity with the feeling of a strong hamstring. Similar results were found in 24 Division II Spanish soccer players . This intervention ran 3x/week for 4 weeks with each session consisting of 1 or 2 eccentric exercises. The authors found significant decreases in hamstring optimum angle by 4◦ in the eccentric exercise group compared to the control group. So What Can You Do To Bulletproof Your Hamstrings? There are 3 variables that dictate the magnitude of the shift in optimum length: 1) the intensity of the eccentric (load, drop height, uni vs. bilateral), 2) the volume (sets/reps), and 3) the length of the muscle during eccentric contractions . The most common eccentric exercise is the Nordic drop which most of you have probably performed yourselves. While this is a great slow eccentric exercise, it only covers one function of the hamstrings which is knee flexion. So the Nordic drop cannot be the only eccentric exercise used to completely bulletproof the hamstrings. Furthermore, if an asymmetry exists between hamstrings, the Nordic drop can exacerbate this leading to greater future injury risk . 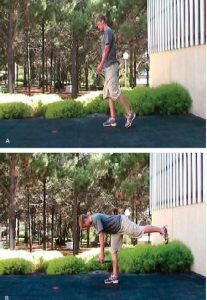 Here’s a bank of eccentric hamstring exercises you can pull from for your eccentric hamstring training. The first 2 videos will explain how you can vary the intensity and volume of your eccentric exercise. I will order these from lowest intensity to highest. The lowest intensity exercises can be made more intense through increasing loading or drop height. 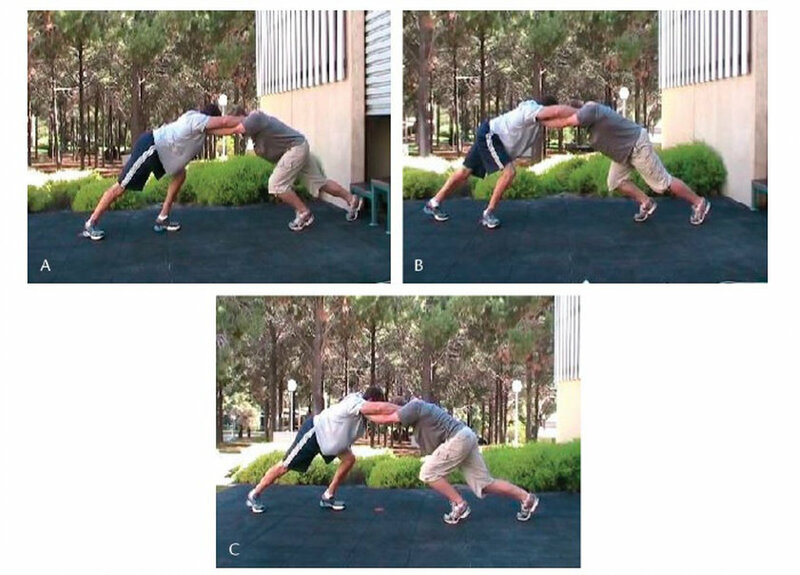 Brughelli, M., Cronin, J., Preventing hamstring injuries in sport. Strength and Conditioning Journal., 2008. 30(1): p. 55-64. 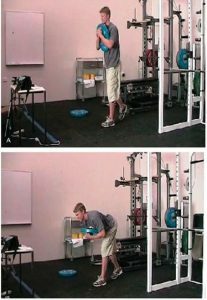 Brughelli, M., Nosaka, K., Cronin, J., Application of eccentric exercise on an Australian Rules football player with recurrent hamstring injuries. Physical Therapy in Sport, 2009. 10: p. 75-80.